Fiona Saunders is a Senior Lecturer in the Management of Engineering Projects at The University of Manchester and a part-time PhD student. Her research interests are in the management of projects in safety-critical industries. Prior to academia, Fiona enjoyed a successful 15 year industry career in project management. Fiona blogs at www.fionasaunders.co.uk where the original version of the post was published, along with a follow up post. Long before I threw caution to the wind and (as a mum with 2 small children) began my part-time PhD my Professor (@AndrewWGale) gave me a very wise piece of advice “Don’t be afraid of a PhD, it’s really just a project”. Now that I am entering the 3rd year of my part-time PhD I want to reflect on the similarities between a PhD and a project and offer some tips on how to use the tools and techniques of project management to make sustained progress in a research degree. Projects where both the “what” and the “how” of the project are well-articulated are called “Painting by Numbers”. Projects where the “what” is clear but the “how it will be achieved” is not are known as “Quests”. 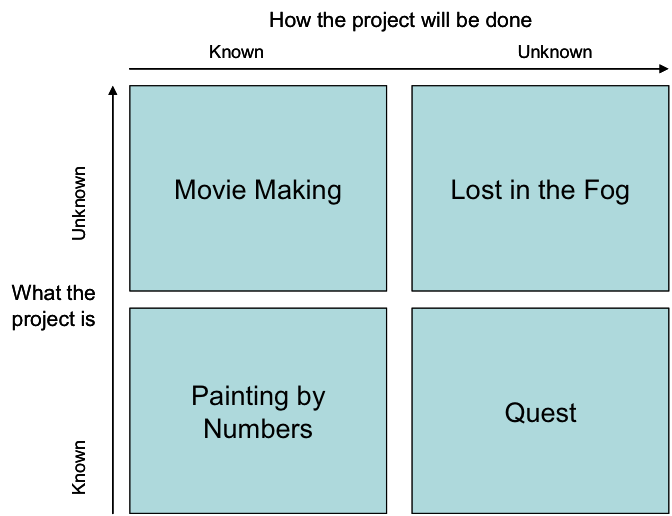 Conversely projects where the “how” is well understood, but the “what” is unclear are labelled “Movie Making”. The fourth and final type of project is “Lost in the Fog”. These rather scary sounding projects are rarer beasts in the corporate and academic world, and involve an organisation undertaking a radically new activity, or pursuing a new strategy. Obeng argues that the “secret of success in these projects is to proceed very carefully, to proceed one step at a time” . It strikes me that, at least in the early days, most PhDs are akin to “Lost in the Fog” projects. Indeed I have experienced many moments when I felt utterly adrift in my research, unable to articulate what I am trying to achieve or how I am going to go about it. My supervisors and academic colleagues reassure me that this is completely normal in a PhD. At such times the only thing to do is to keep working. Keep reading, thinking, talking – just keep going – sometimes for weeks or months at a time. Happily in most cases the fog does not persist indefinitely; it eventually tends to disperse and just like larger projects the PhD will gradually mutate from a “Lost in the Fog” type to a more optimistically sounding “Quest” as you start to define the research questions and explore the different methodological approaches at your disposal. The latter stages of a PhD (I haven’t got there yet) will hopefully be closer in form to a “Movie Making” project where the methodological approach is agreed, and you know what to do to get to the finishing line of thesis submission, even if the final shape of the finished thesis remains something of a mystery – often until the few weeks preceding submission. Some people are planners and some are not. It all goes back to our personality type according to Myers Briggs. I out myself now as a planner – with “to-do” lists and plans an essential part of my professional and personal life. However even if you are not a natural planner I would argue that there are a number of benefits of maintaining some form of plan of work for at least the next stage (say 6 months) of your PhD. Secondly a plan breaks the PhD into more manageable chunks. As the first South African summiteer of Everest @CathyODowd said of climbing the mountain “focusing on the far off summit makes it seem impossible. Looking back at progress & taking one step at a time makes it possible.”Your plan provides your steps up the imposing mountain of the PhD. The satisfaction of ticking off completed tasks in the plan provides a look back at the progress you are making. Thirdly a documented plan of work will inspire confidence from your supervisory team – and this confidence will increase exponentially once you start to deliver what you said you would deliver on the plan. Yes, the direction of the PhD may change and the order and scope of the tasks on the plan may be quite fluid, but at least then you are changing direction from a known baseline rather than arbitrarily. So go on, spend the next hour or so drafting a plan of action for the next six months of your PhD – it’ll be time well spent! That’s the first two lessons from project management for PhD students. One of the biggest barriers to success is lack of clear scope in a PhD, dedicating resource to the project and the importance of good project communications – but that’s a post for another time! « Are you stopping yourself from finishing your PhD? Finished my Ph.D. this past September. Advice given to me was “just write something every day.” Pretty soon I had 243 pages and my research was done. If you look at the totality of it, it is far too overwhelming, but in the day to day, just writing a little bit goes a long way. Another useful blog post on managing your PhD via The Thesis Whisperer. What a good insight for Ph.D. students! Thanks so much for drawing attention to the project, As a planner, found it very confronting when in general organizational skills failed to wrangle Ph.D. into a set of nice. But for hearing that being “Lost in Fog” is not a peerless experience is comforting. Great knowledge base. for a P.HD project with all the great methods and Study tips which can be used in p.hd to make it hassle free. I’ve always thought it was exactly like that – a project and some people give me a certain eye. Good to know there are others that think the same.